anyone see this before ? I thought everyone knew what they said about **** in space. Those asterisks make me feel very apologetic. Sorry. Could have been an interesting experience particularly with that space suit pictured! anyone know how much time to doomsday? I want an exciting space job, where do we go to sign up? Looks like a fun magazine! 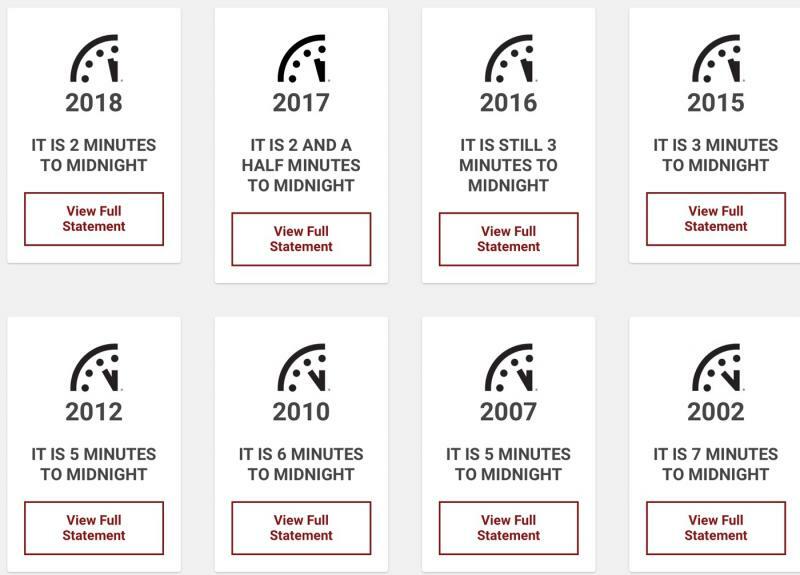 Right now, it’s two minutes to midnight! And it has been creeping up every year recently! I always thought that was the stupidest thing. These guys are supposed to be scientists. How in bloody hell do they figure to be taken seriously? You should read their annual statement. There is a great deal of information factored in to their appraisal. And yes, they are scientists. Well, guess it's a good thing you're a guy Michael, as apparently no females need apply for any of those "1000's of space jobs"! (and that really is a sign of the times...and that's just not this "publication" either.. I was looking thru an old--like 1958 Scientific American magazine the other day--and there were tons of ads by various aerospace companies in it all "looking for some good men" to fill engineering positions with them--again, no women need apply)! It's stupid. Meaningless. It's a bunch of scientists blathering on about politics, period. Yep, absolutely on the money. Scientists should never be allowed to think about the consequences of their work. It is very dangerous to have people trained in statistics, empiricism, outside review, provable and repeatable claims and all similar foolishness,mucking about in things best left to the generally indifferent and ignorant public and the keen minds in various capitols. Now if you ask me our nuclear arms and energy policy should be based strictly on a foundational belief in the goodness of men and on their perfectibility and a windmill in every yard. No atomic weapons, no atomic power, no atomic science thus no atomic scientists and no clock. of spaceships to the moon; of the primary target in war, no longer limited to the armed forces of an enemy, but instead to include his civil populations; of ultimate conflict between a united human race and the sinister forces of some other planetary galaxy; of such dreams and fantasies as to make life the most exciting of all times. Edited by barbarosa, 12 July 2018 - 06:47 PM. Hmmm, aren’t you being a non-scientist blathering on about politics? I merely answered a question. You took the bait and ran with it. Yes and Men is capitalized amid sentence! Talk about the male privilege of the times! 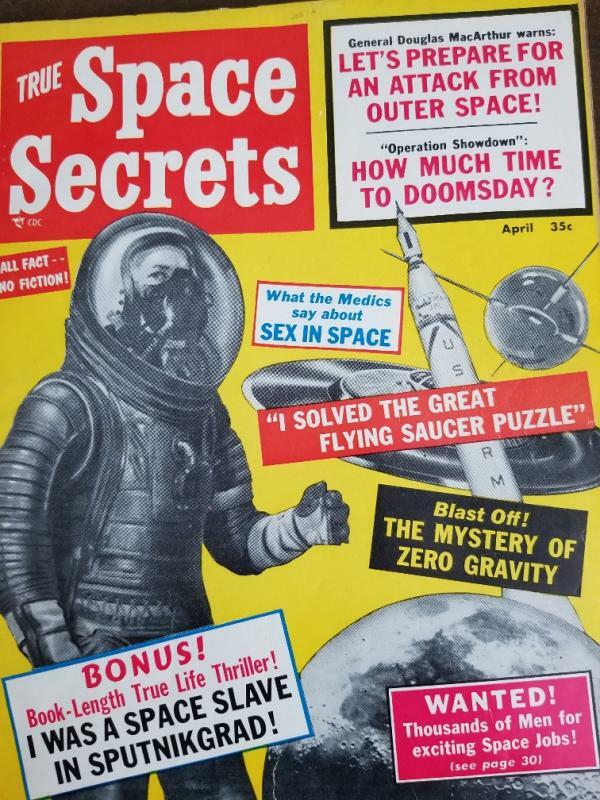 Check out the other lurid tabloid sexist and coldwar captions on that cover! Such were the times when I was blithely living life as a third grader! Edited by terraclarke, 12 July 2018 - 07:16 PM. Where do folks find this cool stuff anyway other than it was in a closet? Really though a saucer is really not the best design for space travel. The astronaut is wearing a half-face oxygen mask, as well as a full pressure suit. That's like wearing suspenders and a belt. Edited by Rock22, 12 July 2018 - 09:02 PM. Nah... best mode of space travel can be seen in this Mercury transit image I um, captured, years ago. One asterisk For each letter .